This page contains information about how Pinnacle Department Managers handle Service Requests. Service Requests (formerly called TSRs) are used to order services from Service Request Management (SRM). Only Pinnacle Department Managers are authorized to submit Service Requests. If you would like to request a service, please work with your department's Pinnacle Department Manager (see below). NOTE: Please notify Technology Services with any additions/changes/deletions to the Pinnacle Department Managers in your department by completing the Pinnacle Department Manager Application/Change Form. To find out who your Pinnacle Department Managers is, visit https://go.illinois.edu/pinnacle (requires either an on campus network connection or the VPN) and choose your campus under Pinnacle Department Managers Report. 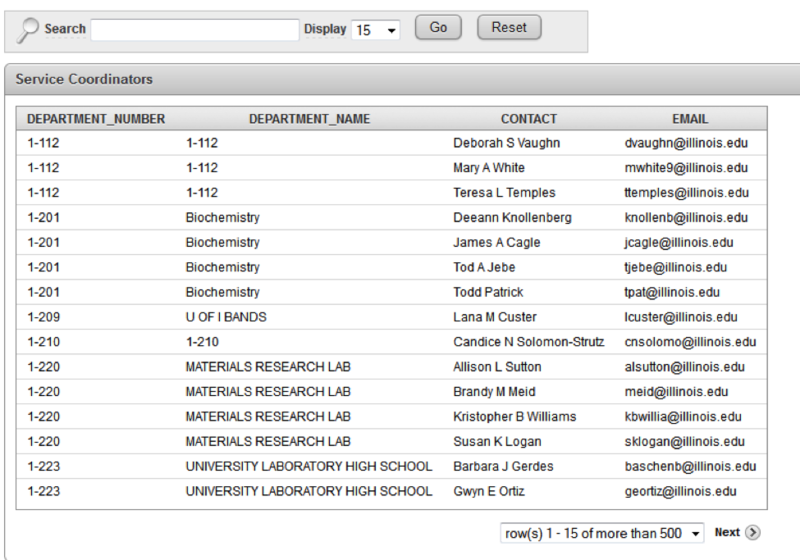 Enter your department's ORG code (formatted X-YYY) in the Search box and click Go. This will narrow the list to your own department's entries. Open the drop-down next to Display and select the number of entries by which you wish to increase the length of the page. Scroll down the page to find the correct entry. Click Next to see the next page of entries. Open the row(s) 1 - 15 of more than 500 drop-down box and select a range of entries to view. NOTE: Pinnacle Department Managers within allied agencies who have an @Banner number will not appear in the list. If you are a Pinnacle Department Managers and need more information, contact Service Request Management at (217) 244-7000, option 2, during regular business hours (8:30am – 5:00pm Monday through Friday). The Pinnacle Communications Management Suite has web pages that open in new browser windows. Before you use the Pinnacle Communications Management Suite pages, disable your pop-up blocker or allow pop-ups from the site. Individuals from non-campus departments that cannot access Pinnacle should call Service Request Management at (217) 244-7000, option 2, during regular business hours (8:30am – 5:00pm Monday through Friday). Pinnacle is a cart/check out application, much like on-line merchants. Service Requests are stored in the cart and you are allowed to submit the requests as multiple or individual requests through the checkout process. Use your NetID and AD password to log in to Pinnacle, and make your service requests in the Services section of the interface. Pinnacle, Quick Start Guide provides instructions on how to use the Pinnacle interface. A confirmation screen appears, thanking you for your order and providing you a Service Request number. Within two hours, an email message containing the request and the Service Request number is sent to the email address provided when you were set up as a Pinnacle Department Manager. Within three business days, a Integrated User Services representative will email final confirmation of the order to your email address. The confirmation will include the Service Request number, installation date, charges, and any special information regarding the order. All service requests submitted after 3 P.M. will not be processed until the next business day. If you need to change your Pinnacle Access Information, such as your organization code, NetID, email address, etc, please submit a new Pinnacle Department Manager Application/Change Form. To prevent an unauthorized person from altering or submitting a Service Request, you will be automatically logged out if the system does not detect activity, such as typing or clicking on links, for thirty minutes. The Pinnacle window will continue to be displayed, but when you attempt to navigate within Pinnacle, you will be returned to the login screen. Unfortunately, any data you may have entered that was not saved in your cart will be lost, so you will need to start over. If you have problems using Pinnacle, call Service Request Management at (217) 244-7000, option 2, during regular business hours (8:30am – 5:00pm Monday through Friday). If the SRM staff is not able to help you immediately, they will refer the problem to a manager who will contact you and help resolve the problem.